Is cross-platform BBM a bad idea for BlackBerry? Can BlackBerry take down Whatsapp? BlackBerry Messenger has been a favourite tool for fans of BlackBerry for many years, and now BlackBerry is hoping to spread the love on the iOS and Android platforms. But this announcement has many wondering: is giving away BBM really such a great idea? On the surface it certainly looks like they are giving current BlackBerry users one more reason to join the mutiny to Android and iOS. If the core reason for staying with BlackBerry up until now had been staying in touch with BBM contacts, then there is no reason to stick around any longer. These users can now ditch BlackBerry and gain access to popular apps, like Instagram, Vine and Spotify, plus they can keep pinging their friends and work colleagues on BBM without any sacrifices. The effect of this move may be felt most in emerging markets,especially in South East Asia where BBM (and the unlimited messaging plans that come with it) are mostly responsible for the huge popularity of the BlackBerry brand. BlackBerry is hoping it will have the opposite effect and drive people to the platform. But will anybody buy the BlackBerry cow if they are giving away the milk for free? This isn't a short-term strategy, and cross-platform BBM is more likely to damage the BlackBerry subscriber base in the near future than help grow it. Current BlackBerry users are keenly aware of the reasons they want to switch (if they do), while iPhone and Android owners generally don't think much about BlackBerry at all. To this end, cross-platform BBM will invariably build BlackBerry's brand awareness. Every time BBM shows up in an app search on iOS or Android, that's a win for BlackBerry. Every download of the app is a new customer. If these new users start to use BBM as their IM app of choice, then it will plant the seed and give BlackBerry a better chance at a sale the next time these customer's contracts come up for renewal. Of course, the big variable here is whether these people end up actually using BBM, and there is already strong competition on the other platforms. With the rise and rise in popularity of the Whatsapp instant messaging service, no BBM announcement is complete without pundits drawing comparisons between the two services. Whatsapp is already cross-platform, boasts twice as many messages per day from a user base which is now nearly three-and-a-half times larger than BBM. With so many people on Whatsapp, will anyone even bother with BBM on iOS and Android? BlackBerry's offering will have a richer feature set though, with video and voice calling coming to the iPhone and Android by the end of the year. There is also BBM's unique screen-sharing capability, where you can stream a mirror of your display during a call, letting your friends browse through your image gallery with you, or share a map while planning a get-together. But ultimately smartphone users aren't loyal to one service or another. At the end of the day, it all comes down to where your friends are. If you have friends among the 60-million people who use BBM, chances are you will download it and get in touch with them. You'll install both Whatsapp and BBM, plus Twitter, Skype and Facebook Messenger and happily switch between them all. This multi-service usage is good news for BlackBerry. Ultimately, it just needs to be part of the conversation, it doesn't need to dominate it. There are hearts and minds to be won on the competing platforms. Still, this is a big gamble for the company formerly known as RIM that could backfire. BlackBerry believes that this is the "right time to do it". 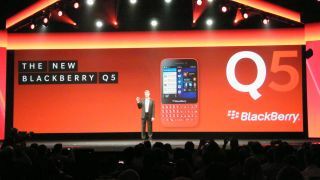 Many of the executives at BlackBerry Live used exactly the same phrase, saying that the company believed that BlackBerry 10 has enough uniquely attractive features to draw in customers besides BBM. It no longer has to rely on BBM to keep customers in the ecosystem, so the company can afford to share the love. Being more inclusive of the other platforms is a great way to reach out to millions and millions of users. But does BlackBerry need to give these users everything? Would a cross-platform text-only service be a smarter play? Give Android and iPhone users a taste - a nibble of the possibilities - but make them switch to a Z10 for the full suite of tools, especially the awesome screen-sharing functionality. Either way, we'll be rooting for BlackBerry in the meantime. It's nice to watch a company getting back up on its feet with innovative ideas at the core of its strategy.